There are a wide variety of teen party food ideas to consider for your next bash. When planning the party, take a few things into consideration. The number of guests, time of year, location and the teen's interests are all important aspects to consider. Once you have decided on the type of party you are planning for your teen, the next step is setting a menu and deciding on what food will be served. Teens love to grab items and keep going on with what they are involved in. Choose simple items that are easy to serve and do not require much work to prepare. Combine1 box of frozen spinach that has been thawed and well drained, 1 16-ounce container of sour cream, 1 cup of mayonnaise, 1 can of water chestnuts and 1 packet of dry ranch dressing. Mix well and refrigerate for at least 2 hours before serving. Serve with pita chips, carrots and celery sticks. 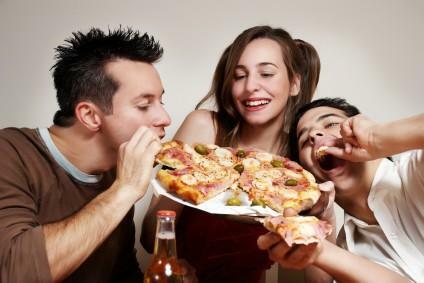 All teens love pizza. Either order out or make your own at home. Pizzas can be made on english muffins or mini bagels. Let the teens choose their own toppings and create their own personal pizzas. A taco bar is a great idea for a party. Set out tacos and wraps, chips, salsa, guacamole, sour cream, cheese, olives, shredded chicken and ground beef. Teen will enjoy making their own tacos and having a fiesta. Another favorite among teens is wings. Serve them with celery and ranch dressing for dipping. Serve several varieties such as hot, barbeque and honey. Ice cream - Make your own sundaes with toppings such as hot fudge, whipped cream, nuts, crushed cookies and sprinkles. The theme of the party can dictate what foods will be served. For example, if you decide on a movie night party, the food can be kept simple. Plenty of popcorn and hotdogs will suffice. Serve soft drinks and movie time candy as well. There are endless teen party food choices to consider for your next celebration. Be creative with your choices and serve the food in a pleasing manner. Presentation can add interest to the foods being served and make the food more attractive to the teens.